Frame Size: 41" x 41"
Cindy Kane has used multi media to explore her lifelong fascination with politics and nature. Growing up in Washington, D.C., she was shaped by the powerful political climate of the Vietnam War era. A self-taught artist, the young Cindy lived and worked at the bottom of the Grand Canyon National Park, where she documented Anasazi Indian pictographs in pen and ink drawings -- images which would inform her art for years to come. 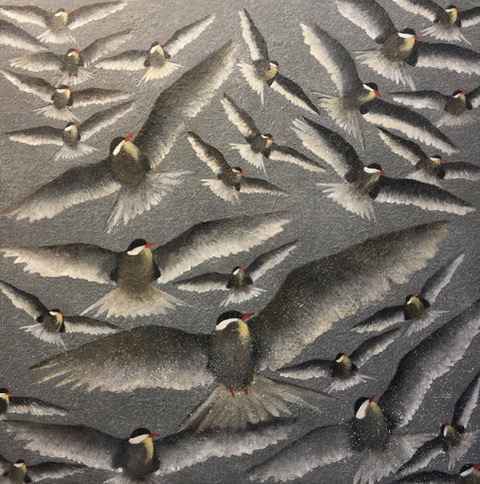 She draws on personal narrative and experience to create her paintings of maps, birds, toys, and artifacts from nature. Her work encompasses a broad range of themes, from the extinction of birds to the role of journalists reporting from war zones. 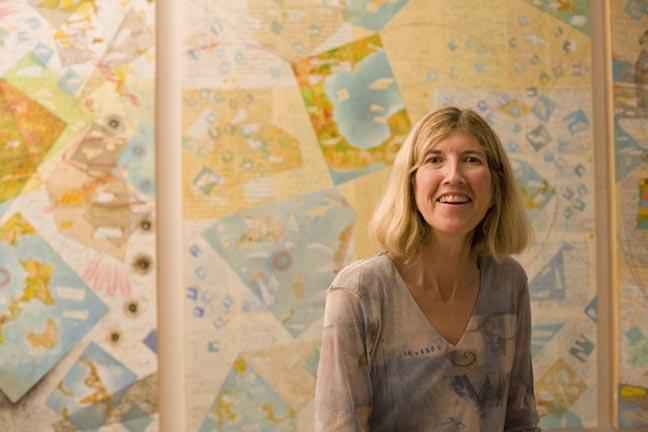 Cindy has exhibited her work nationally in galleries and museums since 1986, and her paintings can be found in a number of private and public collections, including the U.S. Embassies in Tijuana, Mexico, and in Sarajevo, Bosnia and Herzegovina. She lives on Martha's Vineyard, Massachusetts, with her husband and their two daughters. 40" x 40" Framed: 41" x 41"
All items remain property of The Granary Gallery until paid in full.